Hi, Lorraine! So glad to have you at Author Chat, where we can learn a little bit about you, and your book. I always grab my Earl Grey hot tea and maybe a scone or 2! I'm more of a tea person too. Fur or feathers, petwise? Fur, for sure! I am a dog lover and Iove cats, too! Sounds like my house. :) Any pet peeves? One thing that really burns your biscuits? One of my pet peeves are those people at the grocery store or any store for that matter, that will stand in the middle of the aisle and not move even when you politely say in a nice voice-“Excuse me”- well EXCUSE ME! Grocery shopping's the bane of my existence! Favorite quote? My ideal day is cruising on our boat Angelica with my hubby and stopping at Kaibo beach for a nice lunch. Oo, may I tag along? :) If you could live out any fantasy, what would you do? If I could live out any fantasy- well I’ll tell you this is a good one-I am a fairy floating over a field of tall grass and colorful scented flowers where I flitter in and out of each one. Work with me here - please; I mean - have you read my novel? Beethoven, Beatles, Foo Fighters or Keith Urban? Probably Keith Urban if I had to choose out of the 3. I do like Country but I prefer Smooth Jazz and Eighties Classics. Do you have a music playlist for your book? I have not set up a playlist as of yet, but I do know Landslide by Stevie Nicks will be the first. I would love to invite my mother and father to dinner if that were possible. I would give anything to have them back for at least five minutes. Dottie Satters would be the least likely to be invited as she hounded me during my working days and off and always left me drained afterwards. That sounds lovely. I'd love to have my parents back for awhile too. While creating your books, what was one of the most surprising things you learned? While creating books, I have learned that different environments will bring on different results - such as listening to sad music will reflect in my sensitive word choice, as upbeat music will often create an upbeat tone. 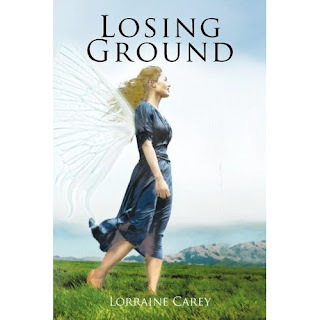 I was grieving while writing Losing Ground, and it shows! Website is still in progress! You may shed a few tears and get a few chills as I share my deep emotions with you! Find out how not only I but my soul mate and spouse is catapulted into this world of the Paranormal! Thanks for chatting, Lorraine! Best of luck to you. Welcome Lorraine! Such an intriguing book cover - it's lovely. Thank you, Cate! It was a pleasure chatting with you. I am writing my next series of novels for young readers and having so much fun with this one!